This recipe I convert from cup measurement to weigh measurement because using weigh measurement is easier and more accurate. The electronic sale is not expensive now (and they can be weight from 1 gram, enough for us to bake at home), but I still include the original cup measurement for anyone who feel good with it. 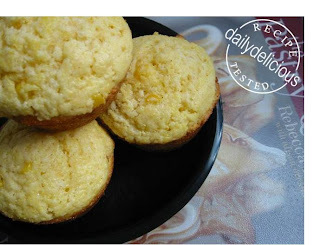 The muffins are easy to make and not too sweet to accompany foods and I suggest using canned corn kernels because they are softer (they are cooked already). Preheat the oven to 180°C. Generously grease twenty-four standard muffin cups or line them with disposable muffin wrappers. Pour the butter, cream, and eggs into the large bowl of a mixer fitted with a paddle attachment. Add the flour, cornmeal, sugar, baking powder, and salt the bowl whisk to combine. And put on top of the butter mixture. Mix at medium speed just until the ingredients are combined and not lumpy. Stir the corn into the batter. Using a medium-size ice cream scoop, fill the muffin cups about two-thirds full with the batter. Sprinkle cornmeal over the tops of the muffins. Bake the muffins for 12 to 15 minutes (but my muffins take longer than that, about 17 minutes), until lightly brown; they should spring back when you touch the tops lightly with your fingertips. They are best served warm (and I hope you can, they’re very good when just come out of the oven). Tip from the book: This batter can be refrigerated in a covered container for 3 days and baked just before serving. Be sure to add 3 to 5 minutes to the baking time to compensate for the temperature of the refrigerated muffin batter. Yes, it mean 3 cups. If you want to convert the cup to weight try this table, http://dailydelicious.blogspot.com/2007/11/basic-pastry-ingredients-weights-and.html.